We are Junk Removal Monster - your go-to choice for domestic and commercial junk removal services anywhere in the London M25 area. “Junk Removal” screams the Junk Removal Monster, hungry for some more of that tasty London waste. The Monster is born in a junk collection truck - half rubbish bag, half scary creature it feeds on household rubbish. Junk clearance is the favourite activity that the Junk Removal Monster likes to do every day. Together with a loyal team of waste collectors, it is able to remove almost any type of rubbish such as domestic and commercial refuse. The Junk Removal Monster company covers all London areas and provides easy-to-book, affordable and reliable junk removal services. For over a decade, the Junk Removal Creature has been London’s premier waste collection solution. Whether it is old furniture you want removed, green waste left after your garden maintenance, those old beat up electrical appliances, builder’s bulky waste, household refuse or other junk, we are capable of disposing of it professionally. And don't forget, the Monster's favourite royal meal is the commercial waste. Call our customer support centre at 020 3404 5414 and receive free no-obligation quote plus any junk disposal information you are interested in. The clearance technicians working with the Junk Removal Monster have years of experience, all the needed licenses, carry identification and bring all necessary equipment, uniforms and other supplies needed to complete the tasks you require. Remember, the Monster will munch out almost every type of waste - from old furniture and appliances to construction waste and garage items. But please,don’t give the Junk Monster any hazardous or medical waste and be aware it does not like raw food leftovers. You surely wouldn’t find a better specialist in the waste collection field in London than the Junk Removal Monster and its team of highly skilled and experienced junk collectors. It’s got attention to details, speed and affordability - everything you need for successful waste removal operation anywhere in London. 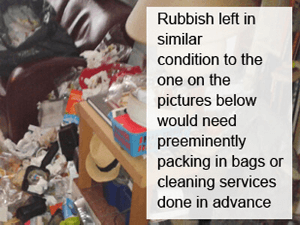 You may also be interested in feeding the Monster on a regular basis - in such case, the regular rubbish collection service is perfect for your needs and by booking a regular service with us, you are eligible for a discount. Don’t be fooled by its name - the waste creature is a very tidy one. Actually, it hates dirty bins, that’s why we care for the condition of your rubbish bin by providing our newest Wheelie Bin Cleaning service as well. Since its birth in 2003, it slowly but steadily made friends with more junk clearance teams and together they expanded the service packages and area coverage to meet the waste removal needs of thousands of customers. 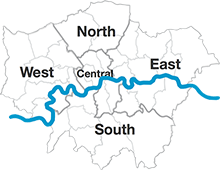 Our rubbish clearance services are now available all around London to help every resident of the capital with any kind of waste disposal. The Junk Removal Monster doesn’t sleep, ever! So neither does the Junk Removal Team and the customer care operatives. Contacting them on 020 3404 5414 is possible 24/7. 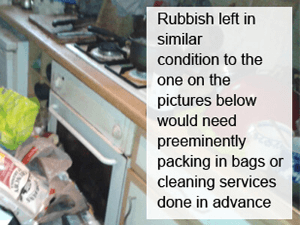 The team of experienced and well-trained rubbish removal specialists is always available - weekends, bank holidays and early mornings or late evenings! After the completion of the waste clearance service in London, the collected junk is being processed at a recycling centre. The price for this is included in the final rubbish disposal price we confirm to our customers upon arrival at their property. An approximate price is given on the phone or via a free online quote. The Junk Removal Monster and its team of rubbish removal experts are on the line to collect your waste anytime, anywhere in London. Actually, they are ready to answer your urgent needs by using their special powers in order to arrive on the same day in two hours time frame and help you dispose of your domestic junk and other unwanted items. You get to choose between the standard approach of calling us, using the handy online chat application or directly booking through the online booking form. Help the Junk Removal Monster protect the environment! Having basic knowledge about recycling will help protect the environment. It is advisable to learn the basics about the three main factors about recycling – Reduce, Reuse and Recycle; also known as The Three R's. Take actions about your waste. Society consumes the natural resources around us at an unsustainable rate and contributes to climate changes. Did you know that every year households and industries generate more than 100 million tonnes of junk? For a free quote or more details call 020 3404 5414 and Junk Removal Monster’s cool office support staff will gladly help you to determine the rubbish removal service most appropriate to your needs.